Today marks the birthday of one of the most influential women in the history of the fashion industry, Gabrielle ‘Coco’ Chanel. Her clothes are iconic, the interlocking C’s, spectator pumps, knit suits, the little quilted black bag, the perfume Chanel No. 5. Chanel is probably one of the most knocked off designers on the planet; just take a visit down to Canal Street in New York where you can buy an imitation Chanel bag for a song. Her name came to mean female emancipation and feminine allure. She was the only fashion designer to be named on TIME Magazine's 100 most influential people of the 20th century. Before her death she was even the subject of a Broadway musical, Coco starring Katherine Hepburn as Chanel. Chanel was not the first woman designer to break into the male dominated world of fashion in Paris, Madeleine Vionnet and Jeanne Lanvin were already designing by the time Chanel opened her first milliner’s shop. The first major fashion house was created by an Englishmen Charles Worth. He was soon joined by Jacques Doucet and finally Paul Poiret, the man who released women from the straightjacket of the corset early in the 20th century. But Chanel was the first designer to use ordinary fabrics such as jersey, and flannel that were normally associated with the working classes in her designs, and the first to use design element usually found in men’s clothing such as open collared shirts, and men’s ties. Like many Scandalous Women, Chanel was a master of reinvention. Along the way, she disavowed anyone who knew the true story of her early life. 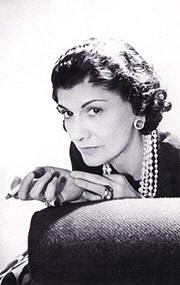 Chanel was born on August 19, 1884 in a hospice to Albert Chanel, an itinerant peddler and Jeanne Devolle. Her parents were not married, making her illegitimate, a fact that she kept hidden out of embarrassment. She was named Gabrielle Bonheur after the nun who took care of her mother. When she was 11, her mother died suddenly and her father disappeared from her life for good. None of Chanel’s relatives were interested in taking in five children, so they were quickly separated; Chanel and her sisters were sent to an orphanage run by nuns in Aubazine, while her two brothers were sent to a work farm. Chanel would later claim that she had been raised by maiden aunts who were cruel to her. Chanel and her sisters lived at the convent for six years, during which Chanel learned how to sew, but it was her Aunt Louise who Chanel spent time with during school holidays who taught her how to sew with imagination..
At the age of twenty, Chanel and her Aunt Adrienne, who was the same age, were living in Moulins, working in a lingerie and hosiery shop. To make extra money, Chanel also worked in a tailor shop, helping to fit the soldiers garrisoned in the town. It was while singing on stage as a lark that Chanel got her nickname of ‘Coco.’ As she sang a song about a Parisian lady who had lost her dog named ‘Coco,’ the crowd of soldiers chanted the refrain. The nickname stuck as Chanel continued to sing as yet another part-time job but her voice was too small make it on the stage as a full-time career. But it didn’t matter because Chanel had already met the man who would change her life, and introduce her not only to a whole new world but also to the man who was the love of her life. Etienne Balsan came from a wealthy family who had made their fortune in textiles (his older brother Jacques later married Consuelo Vanderbilt Marlborough). At the time of their meeting Etienne was a soldier but he planned to leave the army to raise thoroughbred horses. He and Chanel came to an understanding and she moved in with him at Royallieu, even though he had already had a live-in mistress. Chanel accepted his offer because it was an escape from what she perceived was a dead-end life. Without a dowry and no great beauty, Coco knew that no honorable man with prospects would marry her. Instead she accepted Etienne as her protector. She was twenty-one at the time. For six years she lived with Balsan. Etienne was no snob, he was friends with the demimonde of Paris as well as the denizens of the high stakes world of horseracing. Chanel was well aware of her outside status in this world. Even then Chanel stood out amongst the sea of overdressed women with huge hats who attended the races at Longchamps and Deauville. Chanel instead dressed like a schoolgirl, with tailored suits, and boater hat. When she rode, she wore jodhpurs like a jockey. Chanel was dark, slim, with sharp black eyes that took in everything. She relished her outsider status at the same time that she railed against it. She was defiant, and pugnacious, determined and ambitious. Since she couldn’t flutter and flatter like his other lady friends, Chanel became Balsan’s buddy, his chum and sidekick, one of the boys. To compensate for her insecurities, she ridiculed the society women they met at racecourses. Finally, Chanel became bored at doing nothing and being so dependant on Etienne. She was already making hats for his lady friends, so she asked him to set her up in a millinery shop. Instead he offered her his Paris apartment while he attended business in South America, but first he persuaded her to go hunting with him in the Pyrenees. It was here that she met Arthur ‘Boy’ Capel the only man she ever loved. A year older than Chanel, Capel was English, an accomplished polo player, who spoke fluent French. He was handsome with dark hair, and striking green eyes. He loved people, so engaging that people found themselves confiding their deepest secrets to him. His family, who were Catholic, had made their money in coal. Unlike most English gentlemen of his class, Capel worked for a living and enjoyed it. He took the family fortune and multiplied it, diversifying into shipping. Capel supported Chanel’s ambitions to open a millinery shop. Chanel fell in love. “To me, he was my brother, my father, my whole family,” she later said. When he left early to go back to Paris, Chanel left everything and followed him to the train station, leaving Balsan only a note that read “I am leaving with Boy Capel. Forgive me, but I love him.” Capel on his part loved Chanel's determination and chutzpah. He financed Chanel's first stores and his own clothing style, notably his blazers, inspired her creation of the Chanel look. The couple spent time together at fashionable resorts such as Deauville, but he was never faithful to Chanel. Despite this, Chanel loved him; she hoped that he would marry her. They moved into together while Chanel set up shop in Etienne’s apartment where made hats at first for his former mistresses and then for the society women she met through Boy. He taught her about business since Chanel didn’t know the first thing about overdrafts or inventory. By the time of the First World War, Chanel had three shops, her first in the Rue Cambon in Paris near the Ritz Hotel, the second in Deauville, and the third in Biarritz. Timing is everything, and Chanel was always in the right place at the right time. The war changed the way women dressed, as middle and upper class women found themselves volunteering in hospitals, driving ambulances, working in offices, and munitions factories while the men were at war. They needed a new style of dressing and Chanel provided it. She was the first to come up with what we now call ‘sports clothes,’ simple dresses of jersey that draped the body that were loose not figure hugging. Simple tops and jackets that reflected the ease of everyday living. A lieutenant in the army, Boy was busy working behind the scenes as a go-between the French and the English, due to his close relationships with politicians in both governments. Towards the end of the war, Chanel sensed that something was wrong, that he was becoming elusive but she was shocked when Boy told her that he was engaged to be married. His new bride was a war widow and ambulance driver named Diana Lister Wyndham, the daughter of Lord Ribblesdale. Chanel felt betrayed but knew that she could not give him a brilliant marriage, or aristocratic connections. Chanel’s friends rallied around her after Boy’s marriage while her business kept her occupied. No one was more surprised than Chanel that Boy came to her just before Christmas 1919 to tell her that he missed her, that he wanted her back. He stayed with her for a few days, before leaving to go to Cannes to stay with his wife, who was pregnant, and his sister. He never made it. He had an accident on the road to Cannes; a tire on his car had burst, causing the car to overturn. Boy had been killed in the fire that resulted. Chanel immediately set off for Cannes. She was too late for Boy's funeral, but a driver took Chanel to the site of the crash. She got out, walked to the wreckage, and touched it with her hands. Sitting on a stone, she turned her back, and cried. Chanel’s early years have been long fascinated movie makers. So far three movies have been made of her early life. The first, Chanel Solitaire (1981), directed by George Kaczender and starring Marie-France Pisier as Chanel, and Timothy Dalton as Boy Capel. It is not available on DVD, only VHS. The television movie Coco Chanel debuted on Lifetime Television, starring Shirley MacLaine as a 70-year-old Chanel. Directed by Christian Duguay, the film also starred Barbora Bobulova as the young Chanel, Olivier Sitruk as Boy Capel. There is also a film starring Audrey Tautou as the young Coco, and American actor Alessandro Nivola as Boy Capel, directed by Anne Fontaine. The film is titled Coco avant Chanel, it was released in France on 22 April 2009, and in the States it will open on September 25, 2009 in New York and Los Angeles. Chanel has always held me enthralled. And I try to live by two lessons of her life, to always be myself and true to my passion and vision. Happy Birthday, Chanel. She was an amazing woman, one of the few designers to really change the way a woman dressed, and her clothes are still fresh today. Thanks Bitten. Chanel is one of my favorite Scandalous Women. I plan to write more about her life during World War II at some point.